I've seen most of the superhero blockbusters that have hit the big screen in the last ten or fifteen years, but when I heard there would be an upcoming film named Ant-Man, I thought things were getting pretty desperate. While I never went through a superhero comic-book phase, I knew someone who did and even he admitted that to him Ant-Man was a fringe series. The prospect of watching a movie where everything was in miniature gave me flashbacks of Rick Moranis in Honey, I Shrunk the Kids--a fine film for what it was, but certainly not one I would ever see if the cast had been running around in spandex suits firing laser beams. I'm happy to report that the movie was not only better than I expected (considering my expectations were rather low), but it turned out to be a film I rather enjoyed! Here's the basic premise: Scott Lang [Paul Judd] has just been released from prison. Despite holding a master's degree in mechanical engineering, Lang's record as an ex-con prevents him from being able to secure any type of honest full-time employment. When his roommate and former cellmate Luis [Michael Peña] hears of an opportunity to case a billionaire's safe, Lang's desire to be able to come up with child support so he can be reunited with his daughter Cassie pushes him to go back to his life of crime. The theft, however, is actually a set-up designed by former Ant-Man and S.H.I.E.L.D. 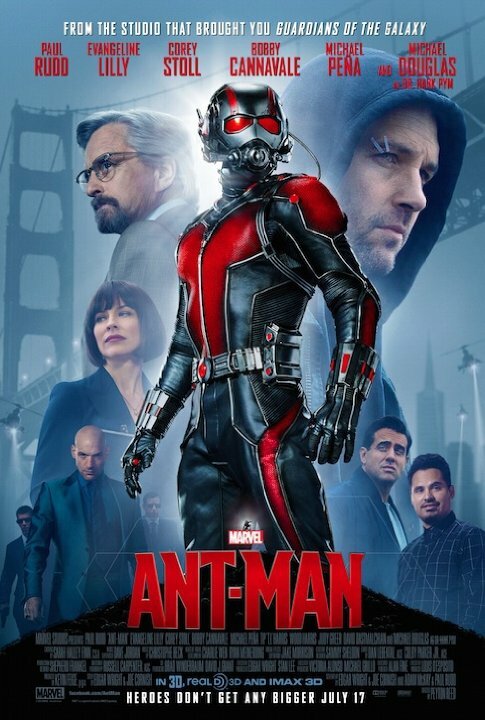 agent Hank Pym [Michael Douglas] who's looking for a successor to don the atom-defying ant-suit and join forces with himself and his daughter Hope [Evangeline Lilly] to stop his former protégé Corey Stoll [Darren Cross] from utilizing Pym's technology to unlease a Yellowjacket suit as a weapon of mass destruction to be sold to the highest bidder. Paul Judd makes the movie. It almost seemed as if he was playing himself: he's funny, likeable, and charming. I wished the writers hadn't made Evangeline Lilly's character so angry all the time--it got a bit old--but her character does develop somewhat as the story continues. The burglary gang Lang puts together includes some great moments of comic relief: Michael Peña is great and made me laugh several times. Lang's daughter Cassie is played by a child actor who manages to be sweet and not at all annoying, a rarity nowadays in the world of Disney star wannabes. I did, however, lose a number of minutes in concentration trying to figure out if the character who played the police officer Paxton [Bobby Cannavale, bottom right] could be the child of the late Les Lye [bottom left], the actor who played Barth on You Can't Do That On Television. 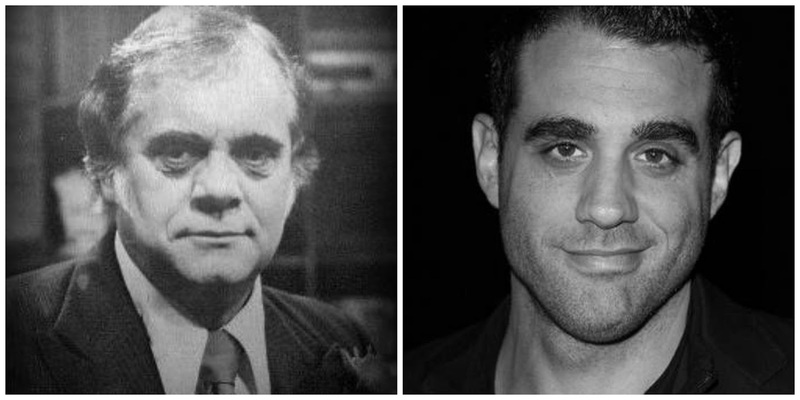 Turns out there's no relation, but they look a bit similar, don't they? If you're looking for a movie to go see this weekend, I'd recommend Ant-Man if you're looking for an entertaining and funny action-adventure. Stay through the credits! Undoubtedly, my favorite part of the movie is the last four words uttered during this tail-end scene! Have you seen Ant-Man? What did you think?